Gu Li 9-dan of China has won his second Japanese-sponsored international title within six months. In the final of the 4th Denso & Toyota Cup, held in Beijing, he defeated his compatriot Piao Wenyao 5-dan with two straight wins to take his third international title. In both games, Piao got off to a slow start and was unable to catch up. This is the first time a Chinese player has won this title. First prize is a handsome 30 million yen. The final was held at the Chinese Qiyuan (= Ki-in) and was telecast live on Beijing TV. China is picking up the pace in international go. At present, it holds four of the seven international titles (Ing, Toyota & Denso, Fujitsu, and Chunlan, with Korea holding the Samsung, LG, and TV Asia) and also the Nong Shim team trophy, so it could claim to be the dominant go power. It has taken its cumulative tally to 14 and at this rate should soon overtake Japan, which has 20, though catching up with Korea, on 55, won't be so easy. The results: Game 1 (6 Jan.). Gu (B) by resig. Game 2 (8 Jan). Gu (W) by resig. In the final of the 13th Samsung Cup, Yi Se-tol 9-dan of Korea defeated Kong Jie 7-dan of China 2-0 to win this title for the third time. This matches the Samsung record of Yi Ch'ang-ho. First prize is 200 million won and second is 50 million. This is Yi's 12th international title, which puts him in lone second place after Yi Ch'ang-ho, who has 21. Cho Hun-hyeon, with 11, drops to third place. The results: Game 1 (19 Jan.). Yi (B) by half a point. Game 2 (21 Jan.). Yi (W) by 2 1/2. These days Gu Li can do no wrong. He followed up his Toyota & Denso Cup triumph by winning the annual play-off between the holders of the Japanese and Chinese versions of the Agon Kiriyama Cup. For the third year in a row, Cho U was unsuccessful as the Japanese representative. This year it was Japan's turn to host the play-off. It was held at the Kyoto headquarters of the Agon Buddhist sect, which sponsors the tournament (Kiriyama is the name of the head priest), on 17 January. Cho seemed to be overanxious to make amends for his past setbacks and he made a number of bad moves in the opening. He recovered in the middle game by punishing an overplay made by Gu, but he was not able to stage an upset. Cho, who had black, resigned after 220 moves. This is Gu's third victory (to no loss) in this series. After Japan started with four successive wins, China has riposted by winning six in a row. In the last half year, Gu has won three Japanese-sponsored international titles: the Fujitsu Cup, the Toyota & Denso Cup, and now this play-off. China is going to be very hard to beat in the 7th Cheongkwanjang Cup, a team tournament contested by China, Korea, and Japan. The sixteen-year-old Song Ronghui 1-dan, who won all four games in the opening round, held last November, extended her winning streak to six before she finally slipped up. Pak Chi-eun 9-dan of Korea was the one to put an end to her winning run; however, she won just one more game before being eliminated by the second Chinese batter, Li He, another 1-dan. In the final game of the round, Li eliminated the last player on the Japanese team. To go into the final round, China still has four players, including Li, to just one (Li Min-chin 5-dan) for Korea, so a Chinese victory looks very much on the cards. If anything, the Chinese women players are doing better than the men in international go. Game 5 (11 Jan). Song Ronghui 1-dan (China) (B) d. Kim Hye-min 5-dan (Korea) by resig. Game 6 (12 Jan.). Song (W) beat Aoki Kikuyo 8-dan (Japan) by resig. Game 7 (13 Jan.). Pak Chi-eun 9-dan (Korea) (W) beat Song by resig. Game 8 (14 Jan.). Pak (W) beat Suzuki Ayumi 4-dan (Japan) by resig. Game 9 (15 Jan.). Li He 1-dan (China) (B) beat Pak by resig. Game 10 (16 Jan). Li (B) beat Umezawa Yukari 5-dan by 12 1/2 points. Yoda Norimoto 9-dan is making his second challenge for the Kisei title, but already his challenge is in trouble, as he has lost the first two games. The 33rd Kisei title match is the second best-of-seven between these two players. Yamashita challenged unsuccessfully for the 28th Meijin title in 2003, but was beaten 1-4 by Yoda. He commented that he 'wanted revenge for that defeat'. Actually, since then he has done very well against Yoda - although they are quite even in overall encounters, with Yamashita leading 11-10, he has won nine of their last ten games. The title match got off to a start in the home prefecture of the two players, Hokkaido, being played at the Sapporo Korakuen Hotel in Sapporo City. Appropriately, the referee, Kobayashi Koichi 9-dan, and the newspaper commentator, Miyazawa Goro 9-dan, were also players hailing from Hokkaido. The second game was played at the Hotel Sun Life Garden in Hiratsuka City, Kanagawa Prefecture, on 28 and 29 January. It was held as one of the events celebrating the 100th birthday of Kitani Minoru, whose home was in this city. After a fierce middle game, Yoda, playing black, had taken a very small lead going into the endgame, but then he made a mistake, letting Yamashita stage an upset. The game finished at 7:38 p.m. on the second day, with White winning by half a point. Instead of being even, Yoda has fallen two games behind, which is a big difference, so the third game could be crucial to the fate of his challenge. It will be played in Onomichi City on 4 and 5 February. Cho U to challenge for Judan title	Cho U earned the right to challenge Takao Shinji for the Judan title by defeating Ko Iso 7-dan, the winner of the Losers' Section, in the play-off between the two sections, held on 29 January. Taking black, Cho forced a resignation. Ko Iso seems to have no luck against Cho: he lost to him in the Winners' Section of the Judan and also in the play-off to decide the Tengen challenger last year. The first game of the 47th Judan title match will be played on 5 March. Umezawa Yukari 5-dan has made a good start in her defence of the 12th Women's Kisei title against Kato Keiko, holder of the Strongest Woman Player title. The first game in the best-of-three was held at the Hotel Sun Life Garden in Hiratsuka City on 22 January. Taking black, Umezawa fell behind early on, but played patiently until she got a chance to stage an upset. She won by 2.5 points and so made a good start in her bid to win this title for three years in a row. This win also changed the tide in encounters between these two: previously, Umezawa had won only one out of eight games. Kato is making her third challenge for the Women's Kisei. Her previous challenges were in the 4th and 6th terms and were both rebuffed by Chinen Kaori with 2-1 scores. The 21st Women's Meijin League, the first league held in a women's tournament in Japan, presented a chaotic picture as it entered its final round on 7 January. Five of the seven players were tied for first place with 5-2 scores. Of course, it was not a real tie because of the ranking system: in the inaugural league the bottom five players were all ranked even in 3rd place, so Kato Keiko 6-dan, as the number one player, was slightly in front. However, four of the five had a chance of winning the league. They were: Kato, Umezawa, Chinen and Yoshida, with Suzuki missing out (besides winning herself, she needed Chinen to win, but she had lost her own game with Chinen, so the latter would prevail over her a tie). In all, including demotions, there were eight possible league results. The key game was Chinen against Kato, as the latter was the only player who could win the league on her own merit, that is, regardless of the other results. Chinen won this game, then was helped by Suzuki and Kobayashi respectively beating Umezawa and Yoshida and so preventing a tie. The hypothetical case concerning Suzuki mentioned above eventuated, so she tied the top score but had to be contented with second place. Three players, Kobayashi (who at least finally put an end to her losing streak in the final round), Yoshida, and Mukai drop out, so there will be four ranked players in the next league. The title match with Xie Yimin will start in early March. Suzuki Ayumi 4-dan (W) beat Umezawa Yukari, Women's Kisei, by 1.5 points. Chinen Kaori 4-dan (W) beat Kato Keiko, Strongest Women Player, by resignation. Kobayashi Izumi 6-dan (B) beat Yoshida Mika 8-dan by resignation. At the end of the fourth round in the 64th Honinbo League, Takao Shinji has the sole lead, with an undefeated record. His closest rival is Yamada Kimio 9-dan on 3-1, so their final-round game could be decisive. If they start losing, other players, including Cho U, could come into the calculations. Yamashita Keigo Kisei (B) defeated Cho U Meijin by resignation. Yoda Norimoto 9-dan (W) defeated Yamada Kimio 9-dan by resignation. Takao Shinji Judan (W) defeated So Yokoku 8-dan by resignation. Kataoka Satoshi 9-dan (W) defeated Nakaonoda Tomomi 9-dan by half a point. Takao has also made a good start in the 34th Meijin League, where he shares the lead with the previous challenger, Iyama Yuta 8-dan, and Ogata Masaki 9-dan. Takao Shinji Judan (W) defeated Sakai Hideyuki 7-dan by resignation. Cho Chikun, 25th Honinbo, (W) defeated Cho Riyu 7-dan by resignation. 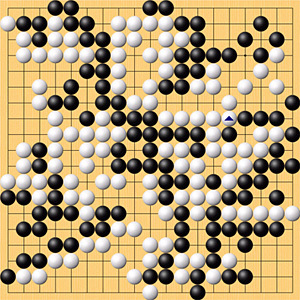 Iyama Yuta 8-dan (B) defeated Yamada Kimio 9-dan by resignation. Ogata Masaki 9-dan (W) defeated O Meien 9-dan by resignation. The 46th Pro-Ama Honinbo match was held at the Sunshine City Igo Salon in Ikebukuro, Tokyo, on 23 December. The amateur Honinbo, Hong Mal Eun Saem, received a handicap of two stones and three points of komi; he won by resignation after 226 moves. After taking 2nd place in the 24th World Amateur Go Championship in 2002, Hong moved to Japan, where he worked as a go instructor and played an active role on the amateur go scene. Although he failed in his ambition to become a professional in his native Korea, he seems to have reached that level now. In the just-completed Agon Kiriyama Cup, which is open to some amateur participation, he defeated four professionals in even games and almost made it to the final qualifying round. It's not surprising that Hane found the handicap too much of a burden. This year we are resuming our regular reports on the results of Michael Redmond 9-dan. He played only one game in the first three weeks of January. Fukui Masaaki 9-dan (W) beat Michael Redmond 9-dan by 2.5 points (Preliminary B, 35th Meijin tournament).